This very nice short video by Scott Wright was made using a camera on a drone, giving some unusual perspectives on familiar Sussex landmarks! 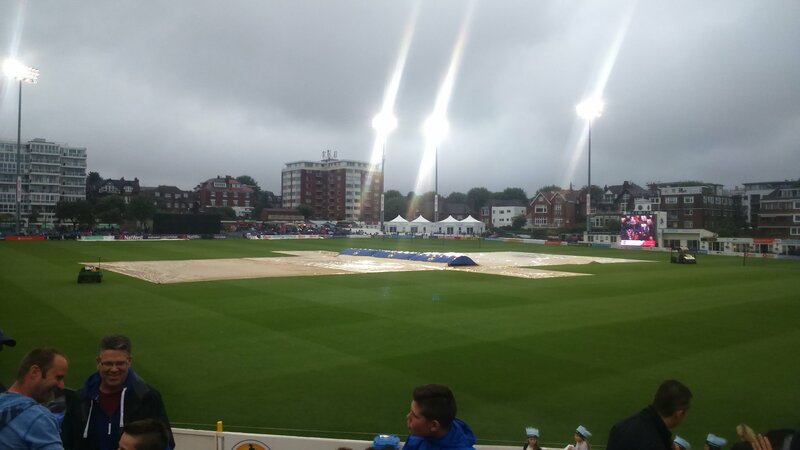 Yesterday (Saturday 22nd August) I took the day off to go to Sussex County Cricket Club‘s ground at Hove watch some cricket and also to watch a play called The Last Match. Here’s a snap I took in the direction of the scoreboard as play commenced, at 11am. As you can see from the picture, it was very sunny yesterday – the high cloud had vanished by the afternoon to leave a perfectly cloudless blue sky. I arrived at the ground already rather hot, having walked from Kemptown (which lies well to the East of Hove) along the seafront and through Brighton city centre to get there. Fortunately, cricket grounds are not short of options for liquid refreshment! The match going on was between Sussex and Yorkshire in the County Championship. 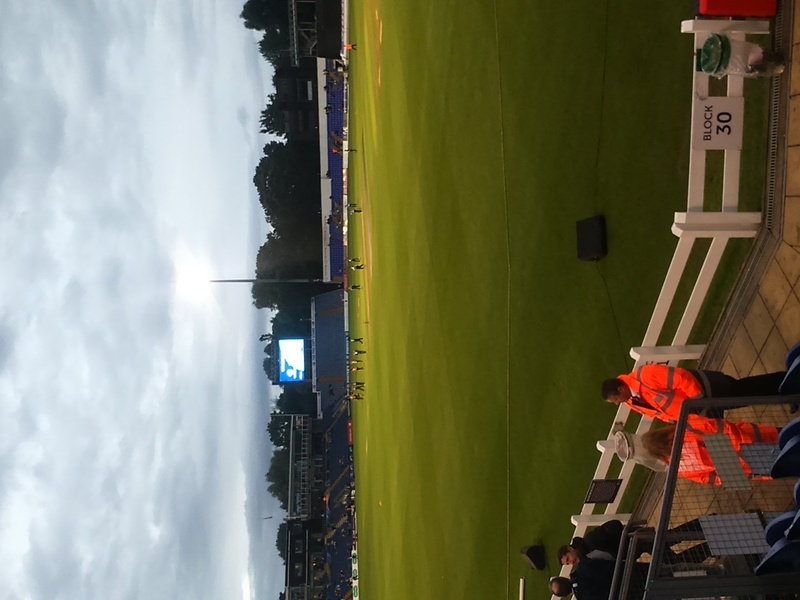 I haven’t seen much County cricket in recent years, but it was good to see a reasonably big crowd there. Many of them were Yorkshire supporters who had presumably made the short trip South from the Midlands to watch the game. Saturday was the second day of a four-day game. Yorkshire had batted first on day 1 and reached 346-6 by close of play, with Gary Ballance not out on 98 and Tim Bresnan not out on 44 (both former England players). No sooner had I settled into my seat than Ballance got his century, but Bresnan took about 35 minutes to get to his fifty. Thereafter the Yorkshire batsman progressed steadily, adding a hundred to their overnight score without losing a wicket but soon after that Ballance was out for 165, clean bowled by Liddle. A few runs later Bresnan was run out in controversial fashion: the batsmen went for a quick single, fielder Chris Nash threw at the bowler’s end whereupon the bowler caught it and fell on the stumps, knocking them all over with Bresnan short of his ground. The umpire’s finger went up, but it should have been not out, because the ball is supposed to hit the stumps at some point. Anyway, the umpire’s decision is final – no reviews in County cricket – so Bresnan was out for 78 with the score on 458-8. Had I been Yorkshire captain I would probably have declared then to let my bowlers have a go at Sussex before lunch. But that didn’t happen. The Play concerned was due to start at 1.15 in one of the function rooms at the boundary of the ground, but the organizers decided to hold back the start until the session of play (in the cricketing sense) had actually finished. As it happened, the last wicket pair for Yorkshire batted about 7 overs and added 35 runs until Plunkett was run out. Yorkshire’s innings closed at 494 all out. Now the Play could start. The subject of The Last Match was legendary Yorkshire spin bowler Hedley Verity. I posted about him not long ago so I won’t repeat his life story here, but the point was that the last match he ever played in for Yorkshire (and indeed the last competitive match he ever played in) was the County Championship fixture against Sussex at Hove which took place from August 30th to September 1st 1939. Hence the poem I posted yesterday, which is actually quoted during the play. The significance of the date September 1st 1939 is that was when German forces began the invasion of Poland, which commenced at 5am UK time. Although Britain did not formally declare war on Germany until 3rd September, the invasion of Poland did lead to various emergency measures being immediately adopted in Britain. One of these was that a plan to evacuate all children of school age from major cities was implemented on that day. On the morning of 1st September the Yorkshire players were told that they should abandon the final day and return home. Verity must have been especially keen to rejoin his family, as he had two young children to think about. Yorkshire had by then already won the County Championship so there wasn’t really that much to play for. However, the players on both sides discussed what to do and decided to play out the match, the main reason being that it was a benefit match for Jim Parks. I’d also suggest that the players probably knew they wouldn’t be playing cricket again for a long time, and wanted to savour the last monents of peaceful normality, much as a condemned man might savour his last cigarette. It’s probable that the cricketers’ minds were not entirely on the match that day, but what happened was remarkable nevertheless. 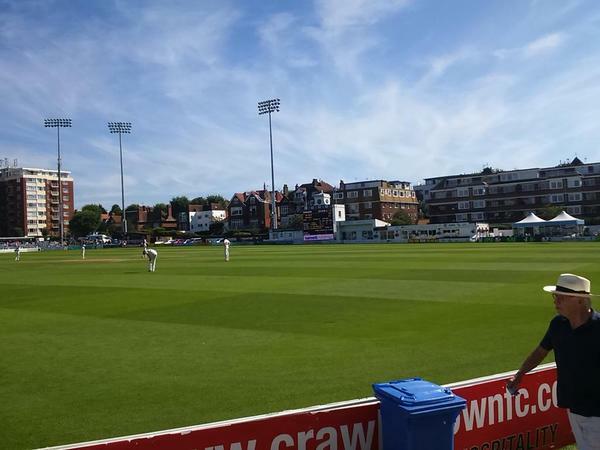 Sussex had batted first and score 387 all out; Yorkshire managed 392 all out in their first innings. Verity had taken only 2 for 108 off 18 overs in the first innings, which makes the second innings all the more remarkable. Sussex were bowled out for a paltry 33, with Verity the destroyer (6-1-9-7). 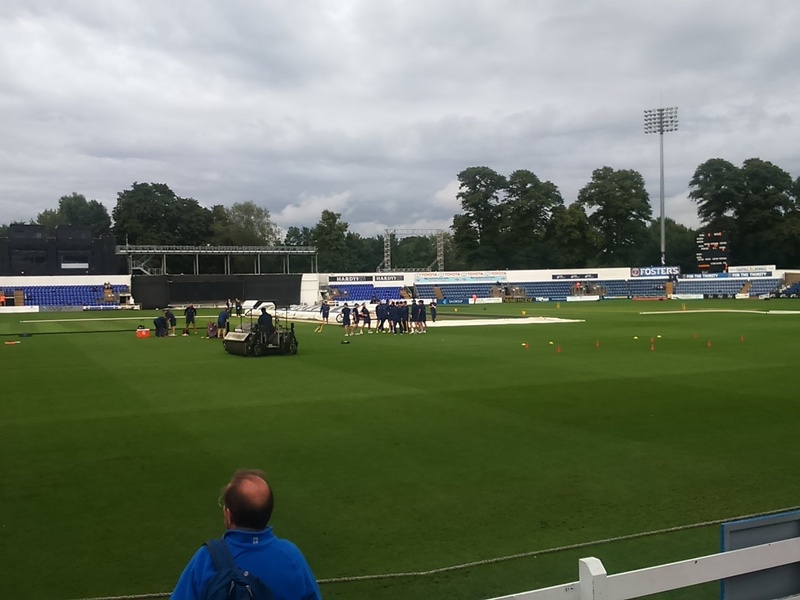 Yorkshire then knocked off the 30 required to win for the loss of one wicket, and won the match. The Yorkshire players bundled onto their coach and travelled home. Verity subsequently enlisted in the British Army and, as a Captain in the Green Howards, took part in the invasion of Sicily in 1943. During the Battle for Catania, Verity was ordered to lead his unit in a night attack on a farmhouse occupied by German soldiers. He did so, but he had walked into a trap and they were quickly surrounded. Half his men were killed and he received a bullet in the chest. He died of his wounds in a prisoner of war camp at Caserta, near Naples on July 31st 1943, at the age of 38, but the official telegram informing his family that he had been killed was not sent until some time later; it was dated 1st September 1943..
Apart a brief preamble and some film footage projected at the rear of the stage, most of The Last Match is set in the hospital in which Verity spent his last days and revolves around a conversation between himself (played by Al Barclay) and a fictional character, Francis Watson (played by Daniel Abelson) whose role is to hold a mirror up to Verity. Francis is younger, more cynical and from a wealthier background than Verity who comes across as rather old-fashioned but with a strong sense of personal duty. It only lasts about 35 minutes, but in that short time it touches on a wide range of issues, especially the conflict between freedom and responsibility. It’s a poignant story, well written and acted, although its brevity means that there’s no time to develop the characters fully. It did occur to me watching it that it would work very well as a radio play, and I hear that there has been some discussion of that possibility. 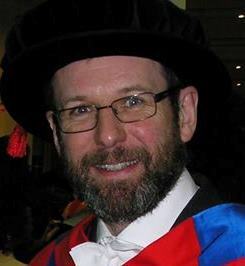 Congratulations to writers Colin Philpott and Kit Monkman for such a thought-provoking piece. 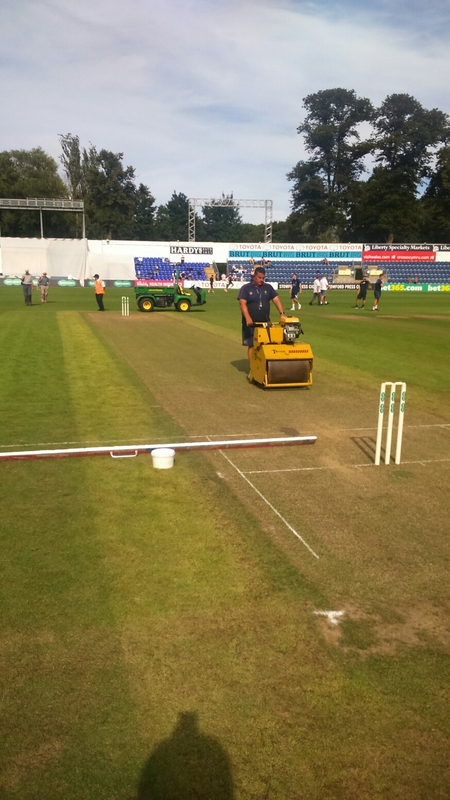 It certainly added an interestingly different dimension to a day’s cricket. The production now moves to Yorkshire – it will be at Yorkshire County Cricket Ground, Headingly on 1st September and again on 24th September, and a couple of other venues in between. Do go and see it if you get a chance. So then it was back to the cricket, sunshine and (I must admit) some beers – Harvey’s mainly! 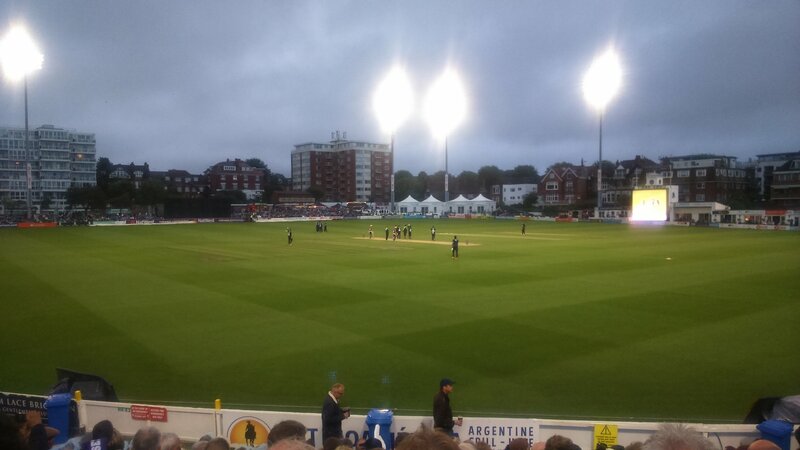 On what seemed to be a good batting wicket, the Sussex batsmen struggled early on against an impressive Yorkshire pace attack (Sidebottom, Bresnan, Plunkett and Patterson; the first three of whom are former England bowlers). Despite numerous appeals, a lot of playing and missing, and more oohs and aahs than you will hear in a Frankie Howerd monologue, openers Ed Joyce and Luke Wells put on 110 for the first wicket before Wells fell to Adil Rashid for 43. A couple of balls later Rashid also dismissed the hapless Machan for a duck. Plunkett trapped Nash lbw for 18 to make it 139-3. Ed Joyce brought up his century with a six off Rashid, and almost immediately departed off the same bowler to make it 175-4, whereupon Sussex sent on a nightwatchman, Oliver Robinson, who was almost out first ball to Rashid but clung on until close of play. Honours pretty even I’d say at the end of day 2, and this (Sunday) morning’s session having been lost to rain with more bad weather forecast for tomorrow, I suspect this one will be a draw. So there you have it. War and peace. Life and death. Sussex and Yorkshire. Beer and lovely weather. What more could you want from a day off? UPDATE: Monday 24th August. 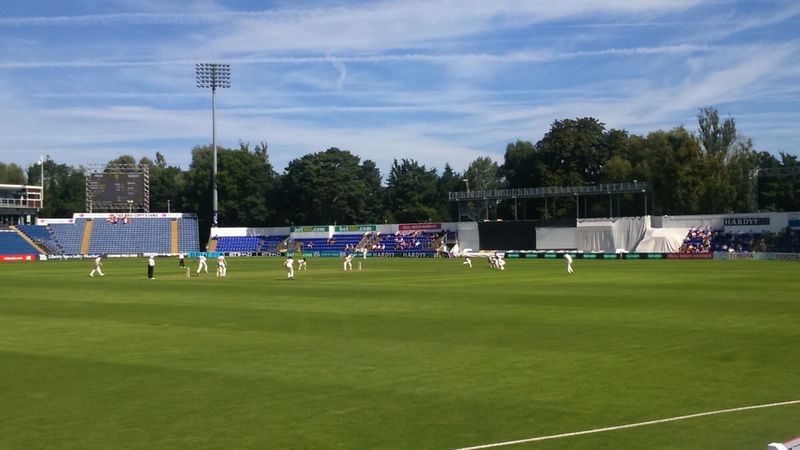 Sussex ended day 3 on 493-7 with centuries for Michael Yardy and Ben Brown. 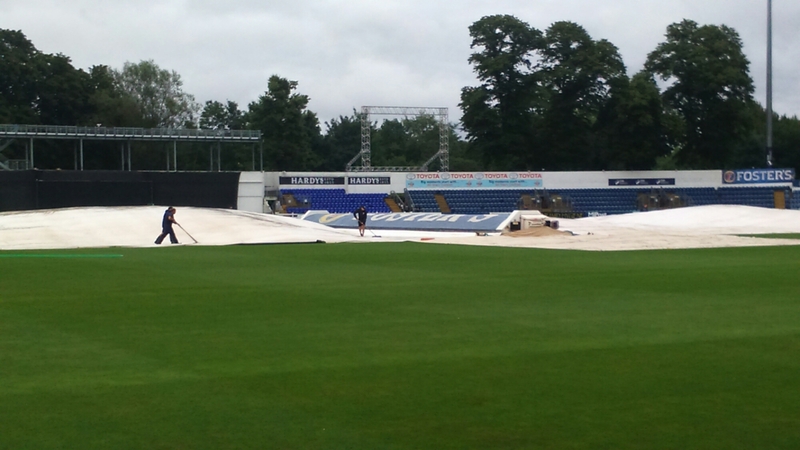 No play was possible this morning, the final day, because of heavy rain, so the match does indeed look set to be a draw. 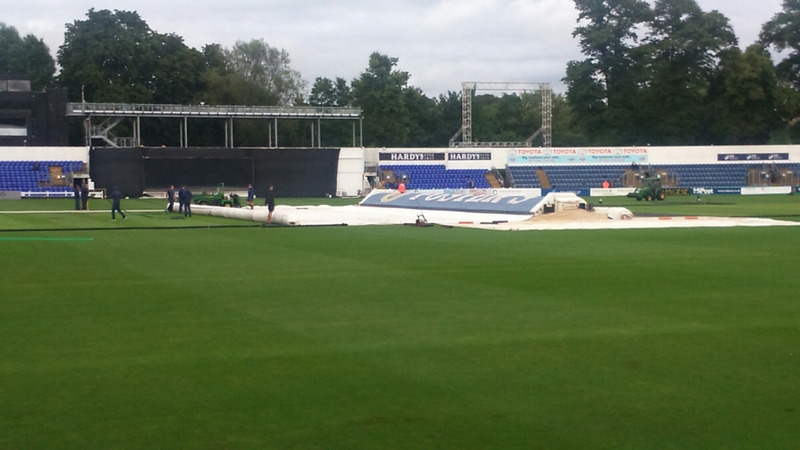 UPDATE to the UPDATE: No play was possible on Monday at all due to rain, so the game did indeed end as a draw.